The following is a presentation into the very esoteric research conducted by Mullard during the 1960’s. It seems their 1962 publication ‘Mullard Technical Communications’ contained some real mind-blowing insights into how tube construction techniques affected the tube performance! Here are some highlights. The first thing to keep in mind is that this research was done to determine how tube construction techniques affected a tube’s predisposition towards being ‘microphonic’. However, I think this information may be able to help explain other phenomenon, such as how one tube can sound ‘different’ than any other tube. Most tubes ‘picked up’ ambient sound waves, which actually caused the tube elements to resonate! The microphonic resonance caused a voltage to appear on the grid of receiving tubes; which could be as high as 320uV! The picture below, taken from the same technical publication, shows the Suppressor Grid of a typical Pentode ringing at a frequency of 2,100Hz. To aid in the study, special tubes were manufactured with cut-out ‘windows’ in the plate structure, allowing the viewing of each element, and making it possible to photograph the results. Do most tubes exhibit piezo-electric properties? It’s up to you to find out. Other tube elements can resonate, as well. Below is a graphical representation of how the getter can cause microphonics and oscillations. The articles mentions…. “Mounting the getter at two points significantly improves the rigidity of the structure, and this is reflected in the results of a comparative test……..”. While the getter does not contribute to the electrical performance of the tube, this resonance can cause other elements to vibrate! Keep in mind the voltages generated by tube element resonance is very small. In conclusion, these ‘ambient’ sounds picked up by the tube were typically a nearby mounted speaker. Of course, the article mentions that the results varied widely with applied frequency, and the output generated by the nearby speaker. So, does this mean the experiments conducted by Mullard support the observation of some tubes ‘behaving’ differently in a separate ‘head’, as opposed to a combo amplifier? I believe so, but again, you need to do some investigative work here, as well. I have merely given you some ‘food for thought’. Also, I have a hunch that these piezo-electric properties can add overtones to the frequency response of the tube! This seemingly disparate ‘chain-of-thoughts’ may be intuitively reasoned by the advertising for tube ‘dampers’, which purport the ability to suppress (dampen) these oscillations. Below is a photograph of a few damper ‘examples’, on 9-pin miniatures and octal tubes. Tube ‘dampers’ have been in use for years in Televions and Radio receivers. 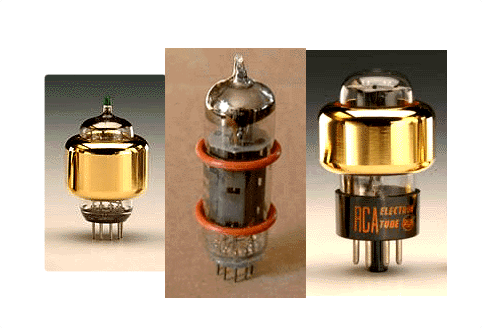 Tube ‘dampers’ have been seen in Televisions and Radio receivers for years. I have witnessed ‘make-shift’ dampers, where the ‘technician’ has used rubber ‘O’ rings, rubber bands, and heat shrink tubing, all in an attempt to reduce micrphonics in a tube. Why they don’t just change the tube is a mystery to me, but some tubes are hard to find today, and it is very hard to find non-microphonic examples of certain tubes. One tube the comes to mind is the 6EU7; Gibson amplifier owners know exactly what I am talking about. Another tube is the 6AN8; I have had horrible luck finding ‘good’ examples of them for many Sunn amplifier owners. If any of this ‘revelation’ is factual, and these oscillations affects the audio range that we guitar players can hear, the word ‘revelation’ is an understatement. These oscillations could be coupled to successive stages, and thus a specific tube could be perceived as having a sound different from tube ‘X’. Research was also previously done by the MO Valve Company, and published by the British trade magazine Electrical Communication in their September, 1954 issue. Where this is important lies in the ‘fact’ that the Electrical Communication article lists acknowledgments and a bibliography that references sixteen other magazine articles and experiments carried out by other valve manufacturers! These include the following. ‘Notes On The Design and Manufacture of Reliable Valves’, E.B. Callick, February, 1950 (unpublished). ‘Measurement of Microphony in Valves’, R. Bird, November, 1951 (Electronic Engineering). ‘Concerning the Reliability of Electron Tubes’, M. A. Acheson and M. McElwee (Sylvania), April, 1951. Remember, most tube manufacturers thought about this years ago, and the goal was to produce consistent, reliable tubes. That is only good business practice, and it would not be in the best interest of RCA, as an example, if their 12AX7 did not sound ‘as good’ as the 12AX7 offered by Sylvania. The standards of what makes a 6L6 a 6L6 were already set by EIA/RETMA, and no one could sell a 12AX7 that had a little less gain than it should have re-labeled as a 12AT7. All of the experimenting discussed above pertains in helping make a vacuum tube less prone to rattling and microphonic behavior. Any well-made 6L6, having equal cathode coating, equal ‘drive’ voltage, and biased to equal idle plate current, will ‘sound’ the same. Copyright © 2019 Tone Lizard. All rights reserved.